The book features the first appearance of Captain America, who is in the spotlight in the new Avengers movie. ComicLink sold a CGC 6.0 Captain America Comics #1 this year for $175,000. 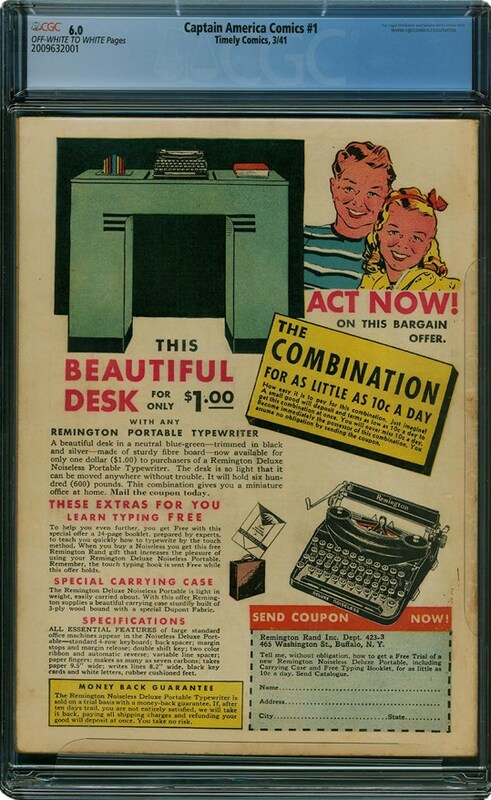 The back of the book features an ad for a Remington typewriter. What makes it special? 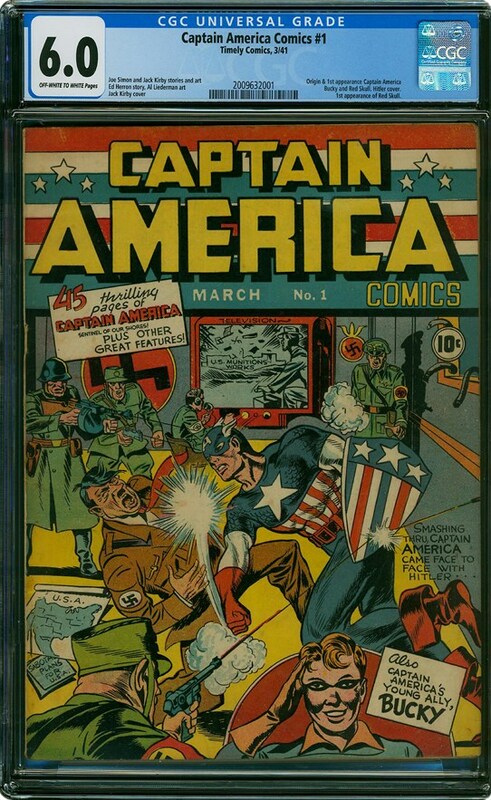 Captain America’s first appearance was memorable: On the cover, he’s seen punching Hitler in the face while deflecting gunfire with his patriotic shield. Inside, the character’s origin is told, as Army reject Steve Rogers is injected with a serum to beef up his mind and body. He goes on to defeat a series of Nazi agents. Did you know? Just a few pages into Captain America Comics #1, the president of the United States name-drops another Timely superhero when he rhetorically asks top military officials how to deal with the Nazi threat: “What would you suggest, gentlemen? A character out of the comic books? Perhaps the Human Torch …” Evans played the Human Torch in a pair of Fantastic Four movies before moving on to his most famous role. Comic book artist Jack Kirby had a key role in the creation of both Captain America and the reimagining in the 1960s of the Human Torch, both of which are now Marvel properties. Total graded by CGC: CGC has graded 165 copies, 80 with Universal labels, 77 with Restored labels, 5 with Qualified labels, and 3 with Signature Series labels. CGC median grade: The median grade for all the books is Fine 6.0, though it’s only Very Good/Fine 5.0 for the ones with the Universal labels. CGC highest graded: As of March 19, 2019, CGC has not graded any copies as Mint 9.9 or 10.0. Only one has been graded in Near Mint/Mint 9.8, and none in Near Mint+ 9.6. 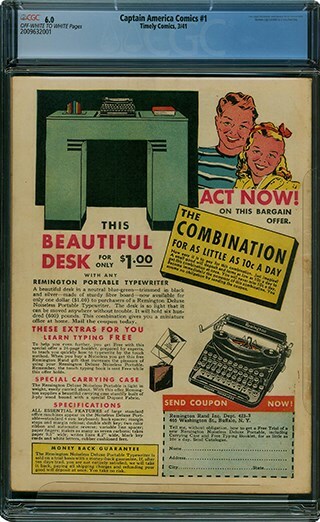 Sales highlights: ComicLink sold a CGC 6.0 Captain America Comics #1 this year for $175,000. Heritage Auctions sold a CGC 3.5 for $119,500 in February 2018. CGC Comics Registry Champion: A set named “Exider’s collection part 1” has won Best in Set Type for seven straight years in the Captain America Comics (Timely) category, which covers 78 books. The winning set includes a Captain America Comics #1 in CGC 8.0. Explore this and other collections in the CGC Comics Registry.